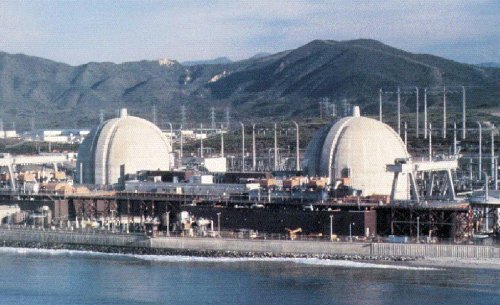 San Onofre Nuclear Generating Station (SONGS) is a 3 unit site located ~10 miles south of San Clemente, California. Unit 1, shutdown in 1992, was a 425 MWe first generation Westinghouse commercial unit (same as Connecticut Yankee) that operated for 25 years. Units 2 and 3 are of the Combustion Engineering 2 Loop Pressurized Water Reactor design. Unit 2 started up in 1983 and Unit 3 in 1984. Each unit is rated at ~ 1100 MWe. SCE provides an excellent resource in their Adobe Acrobat SONGS fact sheets. Because of the mild southern California climate, the SONGS units do not have the traditional sheet metal Turbine Building structure. Rather the girders and support structure are in the open. The 2 units' normal condenser cooling is provided by the Pacific Ocean. A number of simplified diagrams illustrate the the design of this pressurized water reactor plant. Although these diagrams were provided by Westinghouse, they are representative of the Combustion Engineering design. Please refer to the PWR Cycle page. Each reactor has 217 fuel assemblies of the 16x16 design with 236 fuel rods per assembly. The containment is a large steel structure rated at 60 psi pressure. Each reactor coolant loop has 1 U-tube vertical steam generator and 2 reactor coolant pumps. Each unit has a pressurizer connected to one of the 2 loops. Normal makeup water is provided by 1 of 3 Chemical and Volume Control System charging pumps rated at 44 gpm and 2500 psi. On the non-radioactive secondary side of the steam generators, condensate-feedwater is supplied by 4 condensate pumps and 2 turbine-driven feedwater pumps which move the water from the condenser to the steam generators. Pressure and temperature are raised from vacuum and 90F to 1100 psi and 425 F.
2 Low head safety injection pumps rated at 4150 gpm @ 155 psid with a shutoff head of 205 psig supplied from the 245,000 gallon Refueling Water Storage Tank. 3 High head safety injection pumps rated at 415 gpm @ 1250 psid with a shutoff head of 1535 psid supplied first from 1 of 2 11,000 gallon Boric Acid Makeup Tanks, and then from from the 245,000 gallon Refueling Water Storage Tank. 2 motor-driven and 1 turbine-driven Emergency Feedwater pumps supplied from a 150,000 and 500,000 gallons Condensate Storage Tanks with the Pacific Ocean as the Ultimate Heat Sink water source. For detailed information, refer to the NRC Plant Information Books for San Onofre 2 / 3.